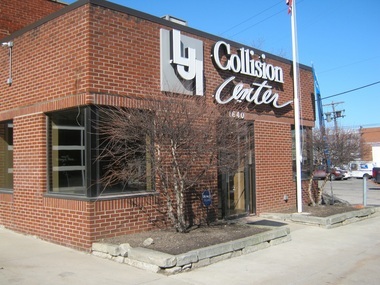 For automotive repair industry veteran Mike Giarrizzo, the opening of LJI Collision Centers’ second location on Lee Road in Cleveland Heights is something of a homecoming. LJI Collision, which opened a brand new state-of-the-art collision center on Chagrin Boulevard in Beachwood just four years ago, has brought the same environmentally-friendly waterborne coating system to its new location, which is actually its original home. “This is where it all started back in 1959,” says Giarrizzo, whose daughters Lauren Angie and Jill Strauss own and operate both locations. 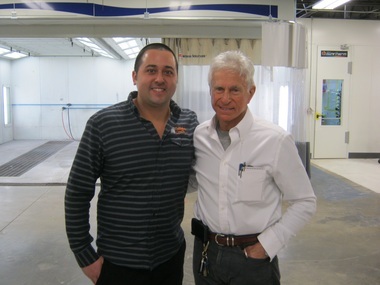 “The family business was here until 1999, when we rolled it up into Sterling Auto Body. But that business closed down in 2005, and the building just sat here. Instead of building a new facility, the business totally renovated and repurposed the existing building that it had under lease, tearing down walls and investing in a brand new Blowtherm spray booth to create the same level of service it offers its customers at its Chagrin Boulevard location. In addition to the new service reception area, LJI also created a larger and more contemporary office area to accommodate its clients. Like the Chagrin Boulevard store, there is also a comfortable customer lounge and a small boutique. From top to bottom throughout the shop, LJI has invested in state-of-the-art equipment throughout the new location, including a new computerized frame alignment machine that maintains tolerances tighter than one millimeter. “Which is what you have to do in order to properly repair today’s vehicles,” adds Giarrizzo. By far, the largest investment in new equipment is the Blowtherm spray booth, which itself easily costs in excess of a million dollars. It’s one of the most advanced prep station and advanced spray booth combination in the industry. The system uses waterborne coatings, which are more environmentally-friendly than solvent-based coatings that use chemicals for thinning pigment solids. The chemicals used in that process release volatile organic compounds (VOC) into the air. Using a waterborne system, like the Sikkens Autowave waterborne coating system used at LJI, greatly reduces the amount of VOCs produced in the repair process. In addition to lessening the amount of VOCs released into the environment, the waterborne coating system is also better for the health of LJI’s employees, which fits right in with some of the other renovations made at the new facility. “We also air-conditioned the entire shop to make it more comfortable for our technicians,” adds Giarrizzo, “and we use a special production process, which is a team concept.” Technicians at LJI move with the vehicle as it goes through the repair process. There are no individual tool kits, each technician using point-of-use tooling as the car moves through the system. That ensures the technicians working on the vehicle are completely familiar with what needs to be done on each vehicle as it moves through the shop. The floor is new, as are the doors, which are quick open and close to keep energy costs down. The shop is also well lit, and is extremely clean for a busy collision center. Maintaining an excellent work environment greatly enhances the quality of work that LJI delivers to its customers. It’s a business model that has worked in Beachwood for the last four years. And it’s a model that will make the new store even more popular than it was in years past.